We almost did not make the trip. After talking it over though, we decided it was a good opportunity, and I would use blogging money that I had saved for the trip. 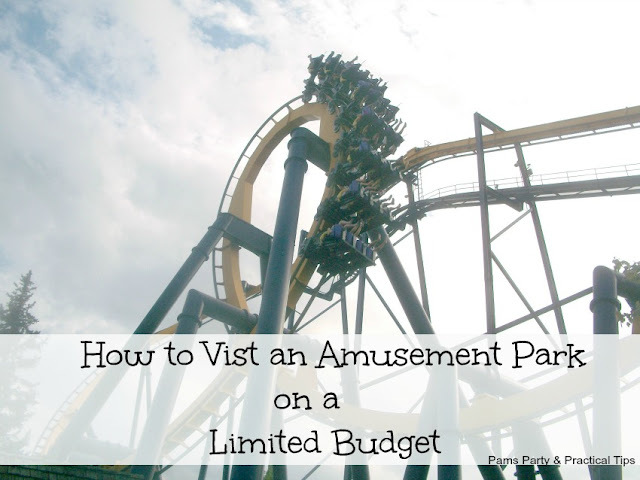 Since I was successful in coming home with some money leftover, I am going to share my tips on how to go to an amusement park on a limited budget. There are ways to find big discounts on the cost of tickets. Don't wait until you get to the park to buy them, or you will be paying the highest price per ticket if you do. We used the 3 Day Advance online option for our tickets. We saved $22 per ticket by buying online, instead of paying the gate price. With these tickets they only require that you wait three days after buying them to come to the park. They are good for the rest of the regular season. Always check the website of the park you are planning to visit, to see what discounts they offer before you go. Another option is stores in the general area of amusement parks will sell discounted tickets at their customer service counter. If you plan on spending the night near the park, check with the hotel. Many times they will offer ticket packages to their guests, sometimes with extras like early entry. Since we got a kind of late start, we needed to stop for dinner along the way. I decided to take the kids to Steak and Shake, when I saw a billboard advertising their new $4 menu. The kids loved it! 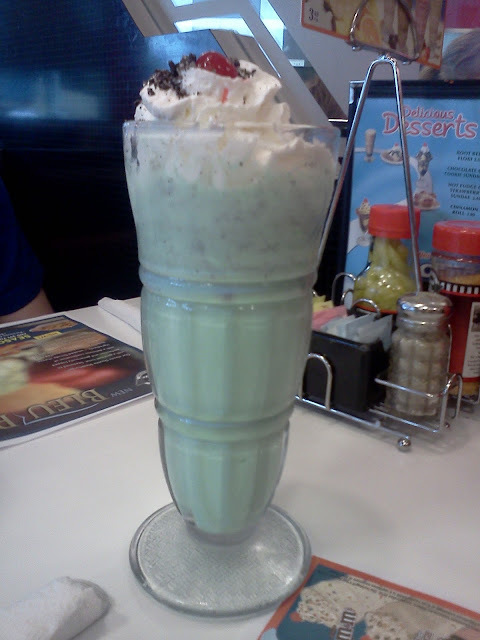 There were several meals they liked on the $4 menu, and Kara got this awesome mint cookies and cream milkshake. The cost for dinner for all of us was only $24! 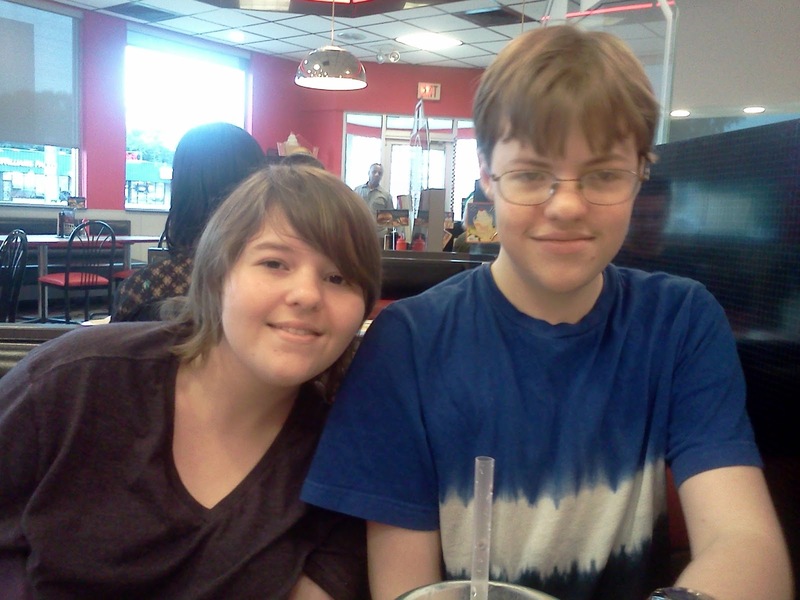 (before tip) I wish we had a Steak and Shake close to our house. Kyle kept saying over and over that he loved it there, and that he couldn't wait to go back. We got to the hotel around 9 p.m. Chicago time. When I was I was looking over the Six Flags website, they had a list of hotels nearby. The one that caught my eye was the Motel 6. It was only about three miles from the park, and kids 17 and under stayed FREE! This is pretty big, because many hotels charge extra per person. I made reservations for the four of us. (dad was not able to make this trip, which made the room even cheaper with only one adult.) We reserved the room for two nights since it would be too late to drive home after we left the park. The total cost for two nights stay was $124 with tax included. That is a great deal considering it is hard to find a room for much less than $70 a night these days. We were also given a great room near the lobby. It was HUGE, more than enough room for all of us. We could have paid a bit more for a hotel that served breakfast, but decided not to. My kids prefer to go to McDonalds for breakfast (a rare treat) so it did not make sense for us to pay extra for that feature. If we lived close enough to go more often, we definitely would have bought a dinner pass. For a flat fee that you pay when you buy the pass, you get to eat lunch and dinner at every visit. Considering the price of the meals, and that there are many choices, this is a fantastic deal. Unfortunately for us, this was a one time visit, so we had to pay for our meal out of pocket. We ate at Aunt Martha's Boarding House for lunch. The meals were all in the $10-$12 range. I found this to be true of pretty much all of the restaurants in the park. What is good about this chicken meal at Aunt Martha's is that it had so much food, it would be good to share between two people with smaller appetites. 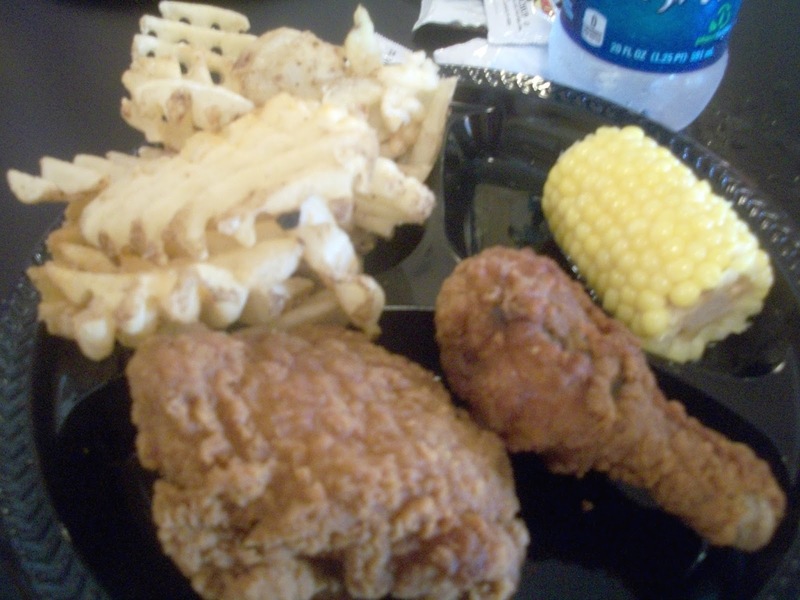 This is the two piece chicken meal which had large helpings. The girls and I had a hard time finishing it all. A really big expense that I was not thrilled about was the cost of a cup of pop. It was over $4 for a regular size. 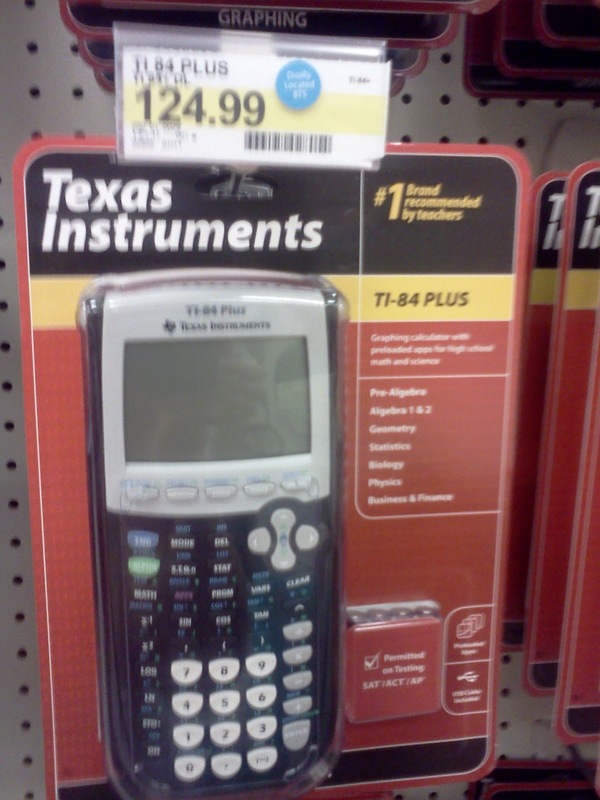 That is more than I am willing to pay for an entire 12 pack of pop at home. They did have a water special where you could buy 2 bottles of water for $6, which saved about $1. Again if we lived closer, we would buy the refillable beverage cups early in the season, and bring it to each visit. The price for lunch was $65, and $15 of that was just for 4 drinks. Ouch! We found out about the family pizza deal after we already had lunch. For about $40, you can get a 16 inch pizza, a large serving of bread sticks, and 4 drinks. 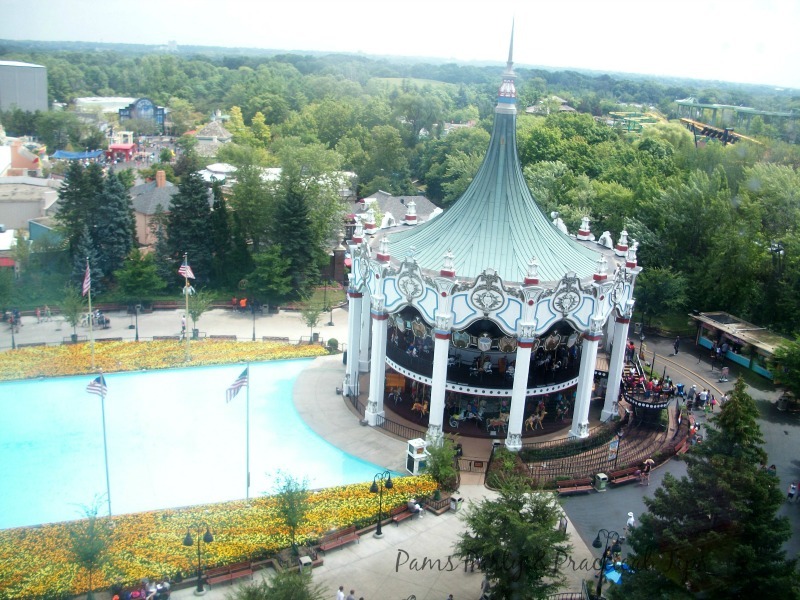 A friend of mine who goes to Six Flags a lot, says it fills up her family of 5, and costs less than individual meals. We had considered doing that for dinner, but we were still full from lunch, and Kara is not really fond of pizza. Another way to cut down on the price of food is to eat a meal right before going to the park, so you are not temped to buy food in the park. 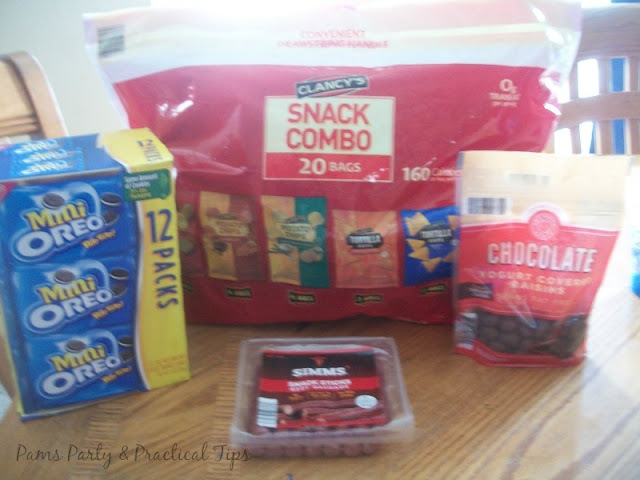 If you don't have to travel like we did, bring food in a cooler and leave it in the car. You are able to get your hand stamped, so you can go back to the car, and get your food during your visit. We all agreed that we did not need another big meal for dinner, since we had such a big lunch around 1:30 p.m. None of us were especially hungry. Instead we decided on sharing a couple of funnel cake sundaes, while waiting for the igNight Finale to begin. These things were huge, and filling. 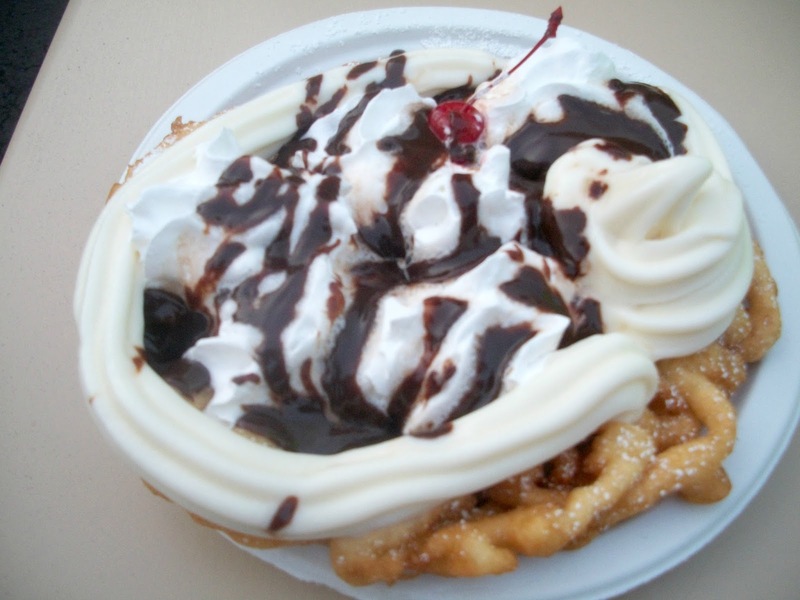 The total cost of two funnel cake sundaes was $23, versus a $40 or $65 meal. We did not buy souvenirs in the park, so at the end of the day I was willing to pay the $15 for the group picture they took of us when we arrived. You could get a package of 3 pictures at a lower cost per picture, but I passed. Kyle was making goofy pictures in all but one picture, so that made the choice easy for me. When I got back to the hotel, I still had $55 left from our day at the park. Yea! I had only brought $180 cash on the trip for all the food and extras for the four of us, and to have them much leftover was awesome. We were tired after our day in the park, and check out was not until 11 a.m. We slept in late, and got a late start back home. It was late enough that we skipped breakfast, and just did a fast food run for lunch. 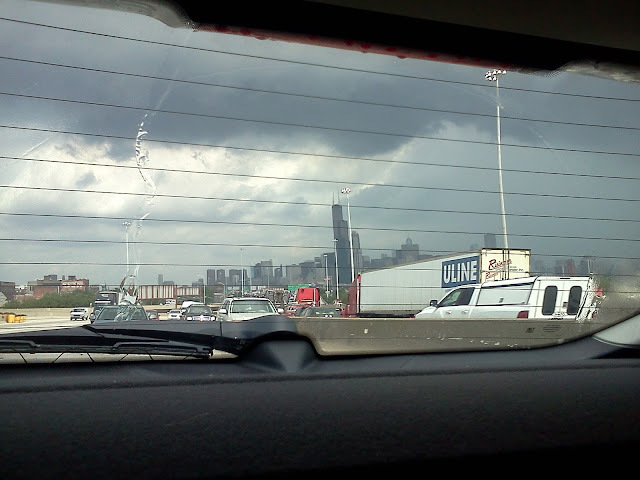 (we get a lot of dollar and value menu items) During our drive through downtown Chicago, we were caught in a torrential rainstorm. It was kind of scary, but the traffic was going slow enough that I did not have a panic attack. It rained three more times on the way home, but I was more familiar with the area. We arrived home about 48 hours after we left, tired, happy and under budget.